I’ve always been a crafty and creative person. From the youngest age, I remember making and painting and planting or decorating or drawing or something creative. Always trying new ways to do things and make things better, make things my “own”. I usually can look at things and see something else, something better, something happier, something more beautiful or functional. It might stem from growing up sharing everything with many siblings and never feeling that I had much of my own. 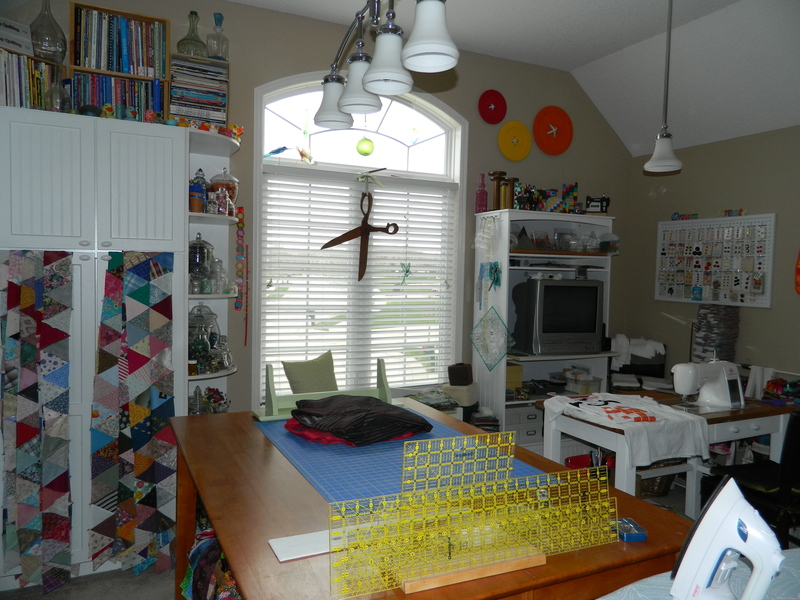 So, when I moved with my then-husband and son from California to Missouri and we were able to go a little nuts with our new house (a semi-custom built, brand new home), one of the things I insisted on having was a craft/sewing room. And I got it. I am an über-organized person and chose cabinets for the storage of my extensive fabric collection. I have been a prolific quilter, having created, completed and given away almost 300 quilts. And I have another 300 or so quilt tops waiting to be quilted and bound. This is how it appears, now almost eight years later. I lined one wall and wrapped it around the corner with the white bead-board cabinets. 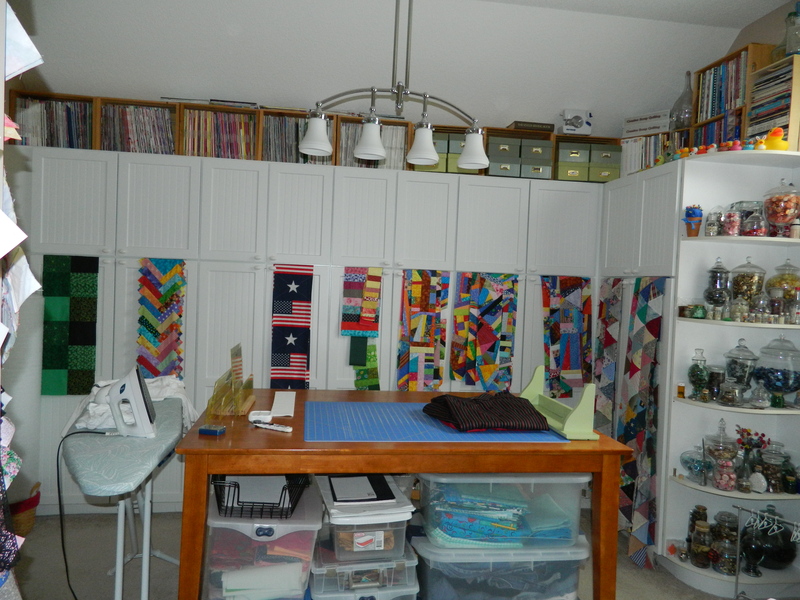 The ones along the long wall are only about 10″ deep; the lower cabinets are tall enough to accommodate bolts of fabric standing… fabric stays much nicer and it is easier to find the pattern and color this way. The upper cabinets allow for smaller cuts of fabric off the bolt, but it allows me to stack it nicely and makes it easy to locate. It also prevents the fabric from fading. 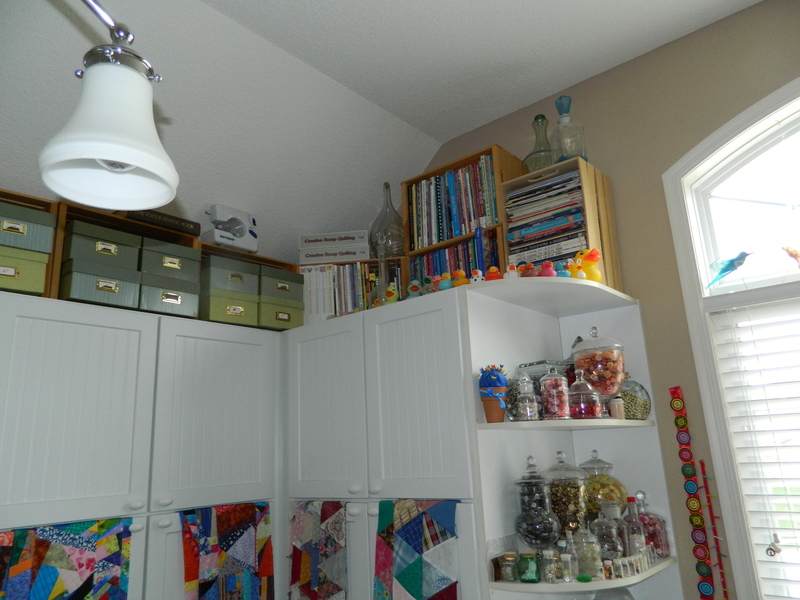 I have the fabrics sorted by color families in the cabinets, reds, blues, greens; even one cabinet of black and whites. Above the cabinets I have room for the orange crates for storage of my quilting and crafting magazines. I also have some photograph boxes that I store pre-cut fabric squares, each labeled neatly. The corner cabinet is much deeper and is perfect for storing stuffing, batting and assorted other materials and equipment. With the extra few inches between the cabinet and window, I had rounded display shelves installed and has become the home of my extensive button collection. It all started innocently enough with a denim picnic quilt that had red buttons at the square intersections. Of course, I only need about 30 or 40 to finish the quilt and the auction I won on eBay included at least 100, so of course, I had to find a way to store/display them. I had this beautiful apothecary-style jar rescued from an estate sale or thrift store and the red buttons were beautiful in it. Added to it my maternal grandmother’s buttons (it was left to me when she passed away) which contained so many wonderful memories. Both my grandmother’s sewed, probably out of necessity, but they each had their specialties. My maternal grandmother love to crochet and my paternal grandmother was a quilter. My mom was an avid embroiderer. My father’s oldest sister, Helga, hand quilted until her death at the age of 103. So I guess it runs in my blood. In the middle of the room, stands a bar height table, perfect for cutting, organizing and crafting. 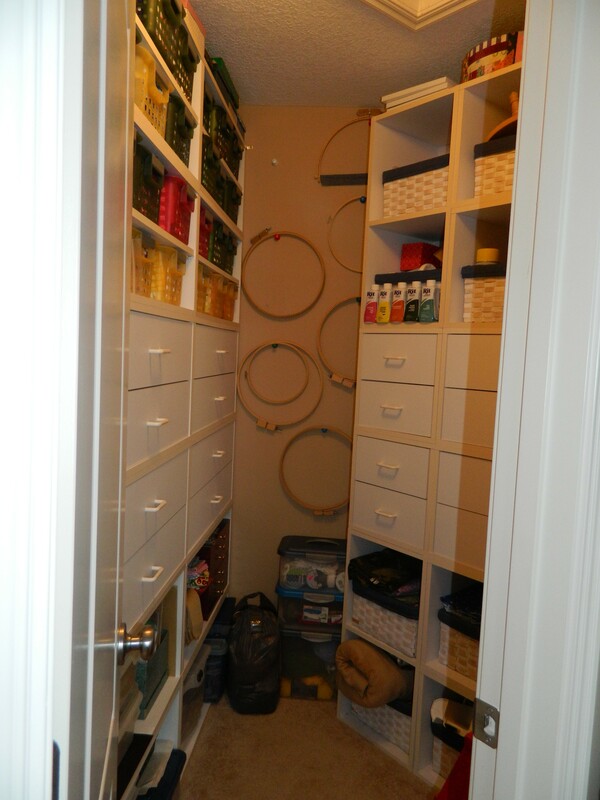 It also allows for storage underneath, accessible to often used fabrics and stashes of assorted goodies. I have multiple cutting mats, rotary cutting tools and cutting rulers. I have found creative ways to store and display these items. I had installed the perfect lighting, a four bulb fixture that hangs directly over the table. Another single matching fixture hangs directly above the sewing table (you’ll see in other photos). And of course, there is the room’s original lighting. 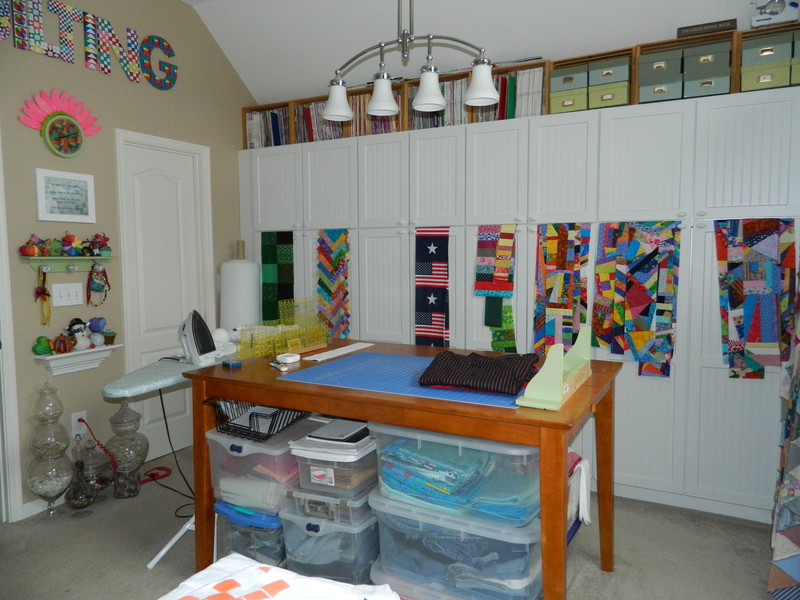 seems every available inch of wall space is covered with something related to sewing, quilting or crafting. 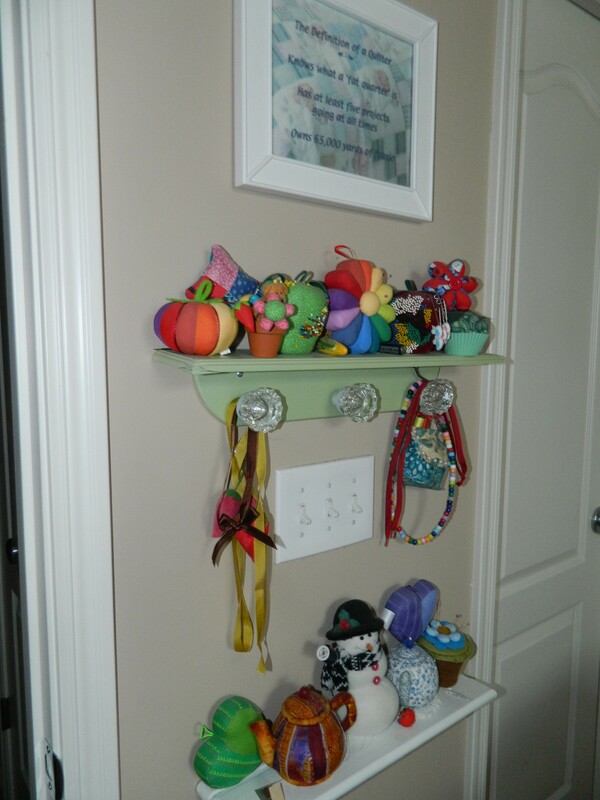 In between the room’s door and the closet’s door allows for the display of just some of my pin cushion collection. It’s amazing when people find out your hobbies, they seem to be on the vigil for the perfect or unique or antique thingamajig to give you. And I love all of them! 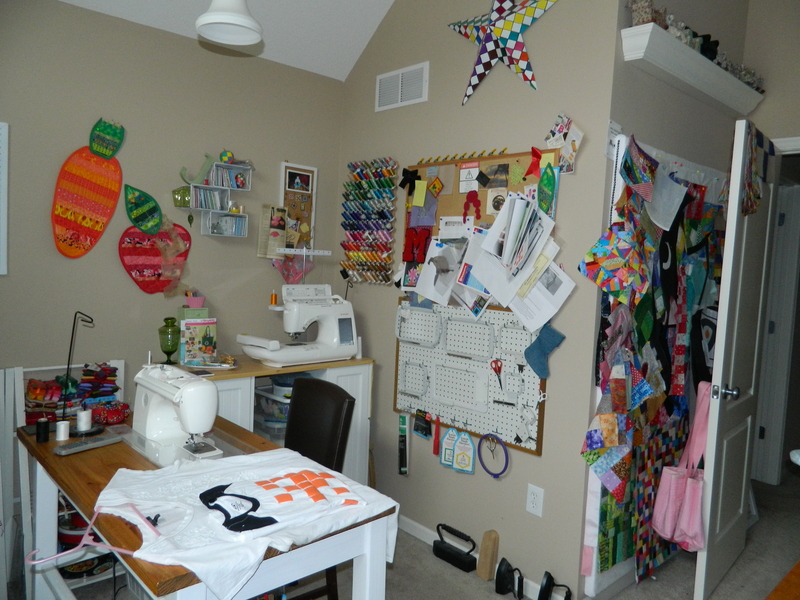 In this corner of the room are my sewing machines. Or more acurately, my sewing machine, my embroidery machine and my serger. When I was much younger, I bought a Singer sewing machine and used that machine for 19 years before it gave out. I think I wore it out, I used it that much. So when it came to replacing it, I opted to stay with the Singer brand and have never been happier with a decision. I have upgraded three times to fancier and more intricate machines, all with a computer “heart”. They have all served me well. Very well. The room technically is a bedroom and has a huge walk-in closet. I removed all the shelves and hanging rods and installed these wonderful shelves/drawer units for more storage. The baskets on the left side are actually storage for fat quarters, all sorted by color. Again, being in the dark, behind a door, keeps the fabrics from fading and reduces dust. Drawers are the perfect storage for ribbons, tools, and other craft items – keeping things neat and organized. So, there you have it, the tour of my favorite room in the house. Er, it may be tied with my home office as my favorite. Love that room as well. There is just no way that I could ever use all of the material and supplies that I have, I have no doubt that my treasures will eventually make for one heck of an estate sale! Well, thanks for dropping by! As always, happy crafting, y’all! Such amazing storage and I love the buttons on the wall. You’ll have to link up to the post this weekend and show off this great space! Thanks Heather! I love spending time there, although it never seems to be as much as I would like. Those cabinets are fabulous, but really the shelves for your button collection is my favorite. I display my buttons sort of like that: I clean out and use candle jars with or without lids. They can’t be used for much else but make beautiful display jars. Thanks for sharing. Thanks Mary! Buttons always make me think of my summers with my Grandma and I love all the wonderful shapes and sizes. 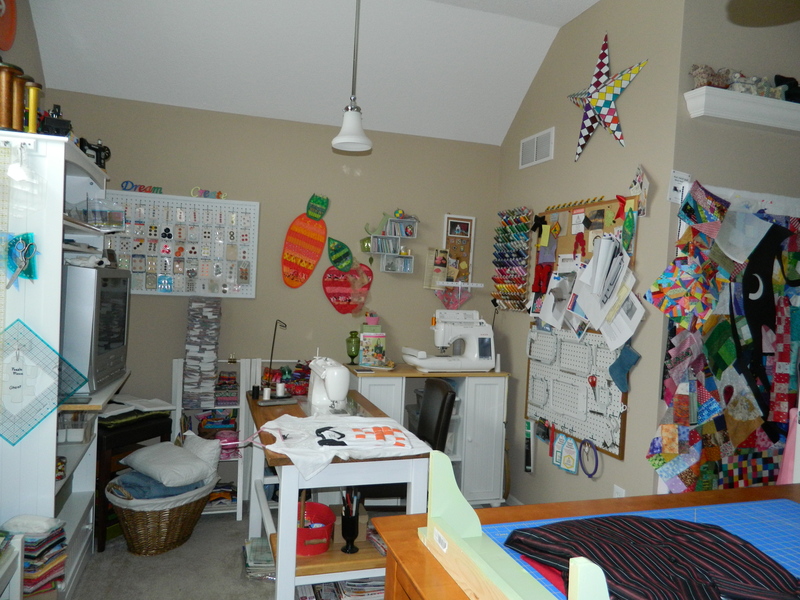 Thanks for joining in my linky party and sharing your studio. LOVE those cabinets! So many lovely things and kept so it’s not overwhelmed by clutter. Very nice! Thank you! BTW, the space right now is amazingly cluttered! I have so many different things going on at once that I often just shut the door and work on something elsewhere in the house! I think its the illusion of not cluttered! !